Bilberry (Vaccinium myrtillus) is one of the most common berries in the boreal forests of Finnish Lapland. As picking of bilberries in the autumn is economically important to local people, follow up of phenological events like flowering and ripening of the first berries is done regularly by both the people and the research organizations like Finnish Forest Research Institute. In Varrio Research Station the flowering date of Bilberry has been followed since 1981. On average Bilberry flowers on 16 June (day number 167 in the calendar year), although variation among the dates is considerable, between 31 May and 2 July (Fugure 1, see also the original data). 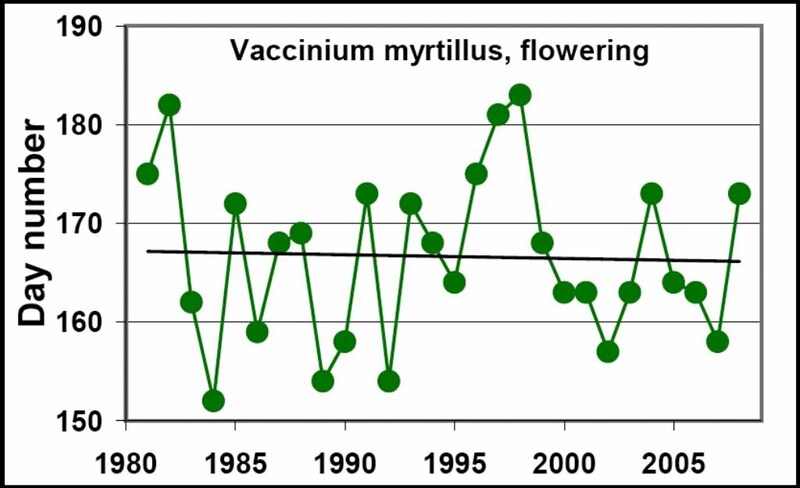 It is also notable in the flowering observations that during the past 27 years there has not been any trend for earlier flowering, for instance as an effect of climate change. On average the snow disappears in Varrio Nature Reserve measurement point on 18 May (day number 138). The earliest date has been 27.4.1990 and the latest 14.6.1982. 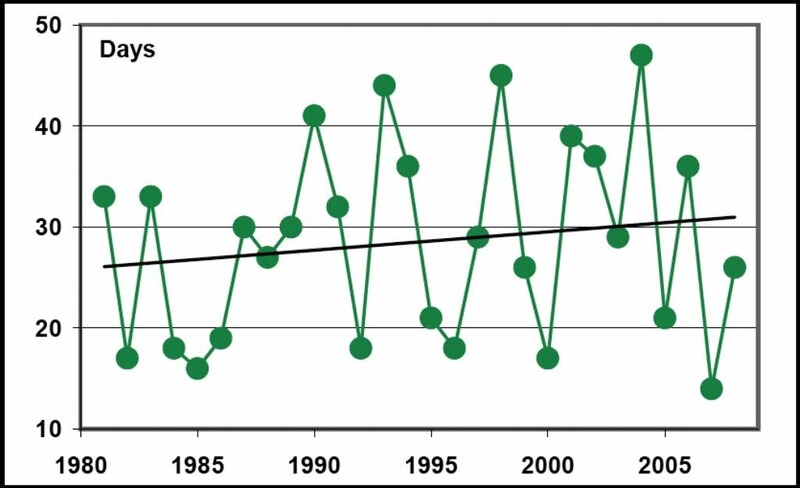 There is a slight downwards trend in the graph, telling that snow disappears somewhat earlier than in the 1970. The trend, however, is not statistically significant. 1981 … 2008, the duration s2 – s1 in calendar days follows. On average, it takes 28.5 Calendar Days for Bilberry from snow disappearance to flowering. The shortest period (in 2007) was 14 days and the longest (in 2004) 47 days. The variance (STDPA) in the data set is 9.53 days and Coefficient of Variation 33.4 per cent. 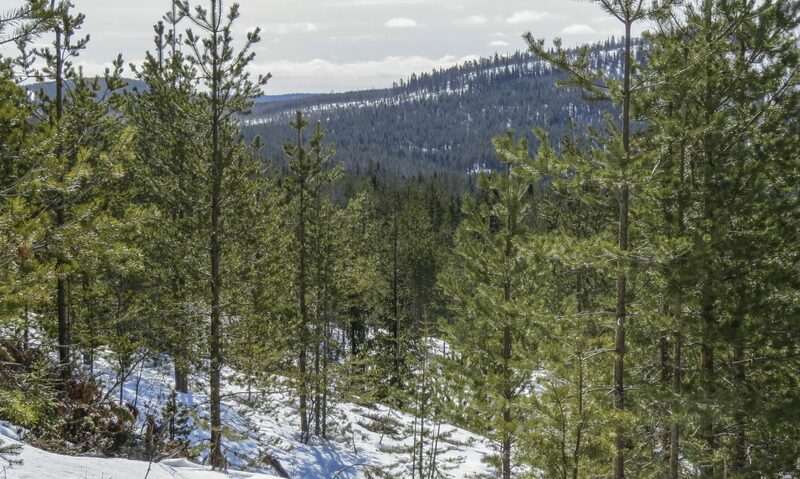 There is a slight upward trend in the data, telling that in the later years it has taken somewhat longer for Bilberry to flower as calculated from the disappearance of the snow. The trend, however, has no statistical significance. The Coefficient of Variation with Calendar Days (33.4%) is lower than with Degree Days (43.9%). This tells that with Bilberry the standard concept of Degree Days does not work. For prediction purposes use of Calendar Days gives more accurate results than use of Degree Days. An obvious reason is that the baseline temperature of 5 degrees is too high for Bilberry. where b is the baseline temperature. Standard Degree Days come from the same equation. When baseline temperature is 5 degrees, M(x) = x – 5. It is notable that Calendar Days also come from the same equation. When baseline temperature approaches minus indefinite, M(x) approaches 1 at all temperatures, which tells that development rate is 1 every day, irrespective of temperature. By reducing it the Coefficent of Variation drops fast. The Coefficient of Variation related to Calendar Days (33.4%) is bypassed at around 3 degrees. This tells that DD-calculation is better than Calendar Day calculation only with baseline temperatures under 3 degrees. The Coefficient of Variation minimizes in a negative baseline temperature of -2.22 degrees (Figure 4).